Here is a press release for an upcoming event in Baytowne Wharf. I caught up with Dikki Du last year for the The Beachcomber. 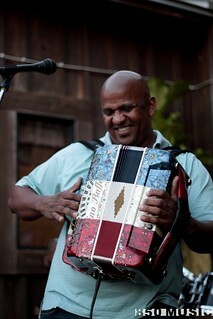 Dikki is part of the Carrier family – which played a giant role in bringing zydeco music to the public. Even Wikipedia says so. Sandestin Golf and Beach Resort announces great gumbo paired with first-rate family fun at the Gulf Coast’s favorite winter food event – the 25th Annual Sandestin Gumbo Festival, held on Friday and Saturday, Feb. 14-15, 2014 at the Village of Baytowne Wharf. People from all over the southeast are expected to join in the festivities during the extended Presidents Day weekend. The Sandestin Gumbo Festival has been known as one of the largest and most popular winter food events along Florida’s Gulf Coast. Now in its 25th year, the event takes over Baytowne Wharf during Presidents Day weekend. Kick-off the weekend Friday, Feb. 14 at Marina Bar & Grill with a delicious seafood boil starting at 2 p.m. On Saturday, Feb. 15 from 12-4 p.m. guests will enjoy live Zydeco music from Dikki Du and the Zydeco Krewe, family activities and the best gumbo cook-off on the Gulf Coast. This year is promising to serve up fun for everyone. Tickets are now available for purchase online at sandestingumbofestival.com. Festival guests can vote for “The People’s Choice” awards in gumbo and become eligible for raffle items from the participating restaurants. After “The People’s Choice” honors are given, judges will award the “Best Display” with one winner. The awards ceremony will begin at approximately 4 p.m.
Tickets are $20 in advance and $25 on event day. 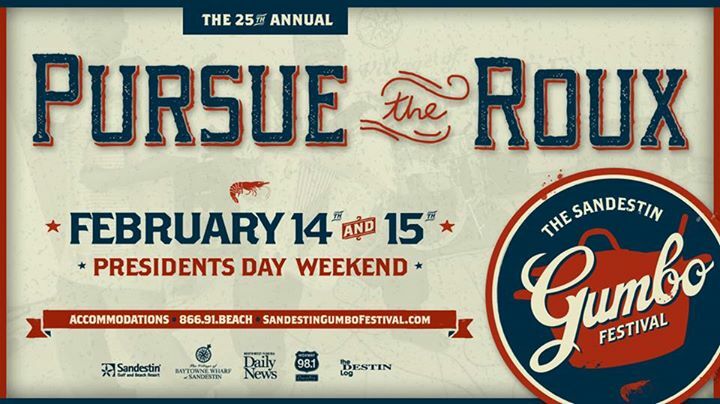 Tickets are available for purchase at http://www.sandestingumbofestival.com or at Graffiti & the Funky Blues Shack, Aloha Surf Company and the Grand Sandestin Concierge. The Sandestin Gumbo Festival is proud to partner with the Sandestin Foundation for Kids, where a portion of the net event proceeds benefit Sandestin Foundation for Kids’ causes and organizations that have the most impact and make a meaningful and positive difference in the lives of children. The Village of Baytowne Wharf invites local businesses and restaurants to join in the fun by becoming a gumbo participant. Participants of the Sandestin Gumbo Festival will be included in the event’s marketing package, have an opportunity to win radio and print advertising through our sponsors and award winners will receive prize money. E-mail contact@baytownewharf.com for more information. Sandestin is making it easy to get away for the weekend with a variety of options and deals for individuals and families. Discounted packages are available with rates starting at only $89 per night (Code: HOT). Other special deals include 30% off with the purchase of three or more nights (Code: SAVE30). Book your Presidents Day Weekend at http://www.sandestin.com or call 866-91-BEACH. All of Sandestin Golf and Beach Resort’s packages and accommodations come with a wide variety of recreational activities including complimentary bike rental, tennis court time, on-site tram service, access to fitness center access and so much more. This entry was posted on January 27, 2014 by 850music in Posts, Press Release and tagged Baytowne Wharf, press release, Sandestin Golf and Beach Resort.